According to the 2018 Benchmarks, Budgets, and Trends Report, 97% of B2B marketers use LinkedIn to distribute their company’s content. In other words, if your B2B company ISN’T using LinkedIn this way, you’re among a mere 3% of B2B businesses in the U.S. to not to leverage one its most powerful benefits. As the modern buying process continues to change and buyers conduct more pre-sale research online, social platforms have evolved into more than just a place to stay in touch with your friends and family — and nowhere is that change more apparent than LinkedIn. 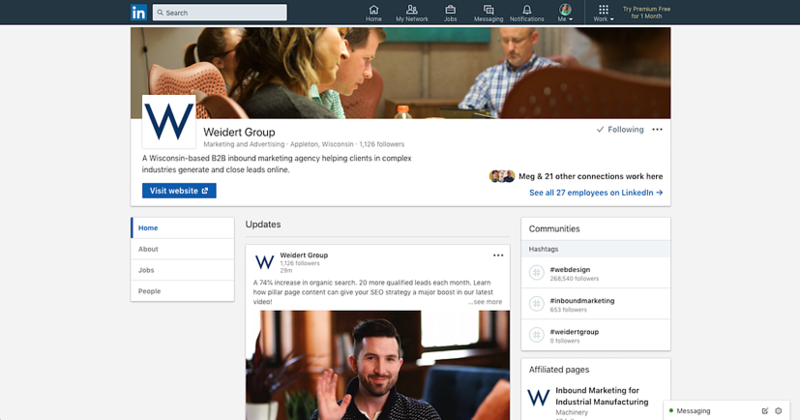 As a network full of more than 500+ million business professionals (40% of whose monthly active users go to it daily), LinkedIn has become an indispensable resource for B2B companies that are looking to build their online presence. Still think it’s only used for job postings? Think again! While career search is still a major feature of LinkedIn, this social network has evolved to become far more. Today, it’s primarily used as a platform for businesses to build credibility within their industries and interact with B2B decision makers in a professional setting. Today, professionals are using it to build quality relationships with prospects and drive traffic back to their websites. Though Facebook and Twitter might be the most popular social networking sites overall, LinkedIn is where all the business decision makers hang out (61 million users are senior level influencers and 40 million are in decision-making positions). Because LinkedIn is strictly intended for businesses and professionals, B2B companies will have better opportunities to generate leads because users are already looking for business-specific, industry-related information. That’s right: half of all social traffic to B2B sites comes from LinkedIn. Every marketer is eager to attract more visitors to their websites, with the goal of converting as many of them into leads (and, eventually, customers) as possible. When you share links to valuable content on LinkedIn, you’re potentially reaching thousands of your best prospects who will go to your site to get that content — and convert as leads. If you’re doing B2B social media effectively, your posts will help drive traffic back to your website. And while a visitor is merely just a traffic statistic if they don’t convert on an offer, according to data from HubSpot visitors from LinkedIn are 3x more likely to become a lead compared to visitors from both Twitter and Facebook. Because LinkedIn users are already looking for business-specific, industry-related content, they’re more likely to convert on your company’s. And if that's not enough, 39% say that social tools reduced the amount of time they need to spend researching accounts and contacts. On LinkedIn, prospects find everything they need to know about you (including testimonials and reviews from peers) in order to validate your company as one worth reaching out to. Social selling targets social buyers, who use online connections to support their purchase decisions. Building a strong network through social media channels allows you to ask mutual connections for introductions to new prospects; coming from a connection, you’ll be seen as a trusted source. That trust is an important for both clients and salespeople, with 87% of B2B buyers saying they would have a favorable impression of someone introduced through their professional network. LinkedIn is a place for these social buyers to verify your company’s expertise and check to see if you share any common connections. By 2020, it’s estimated that more than 80% of the buying process will occur online, without any direct human-to-human interaction. With so many transactions occurring online these days, companies rely on their social buyer employees to help find the best products, services, and deals. Because these social buyers know how to navigate the modern marketplace, companies trust them with larger budgets and more responsibility. That being said, your company can’t benefit from their buying power if you don’t have an online presence! LinkedIn is, without a doubt, the most valuable social networking site for B2B companies, and the evidence above helps prove it. Though Facebook and Twitter also have their benefits, LinkedIn is the only true “must-have” for B2B companies and their marketing and sales teams in 2019.